Hey yall! 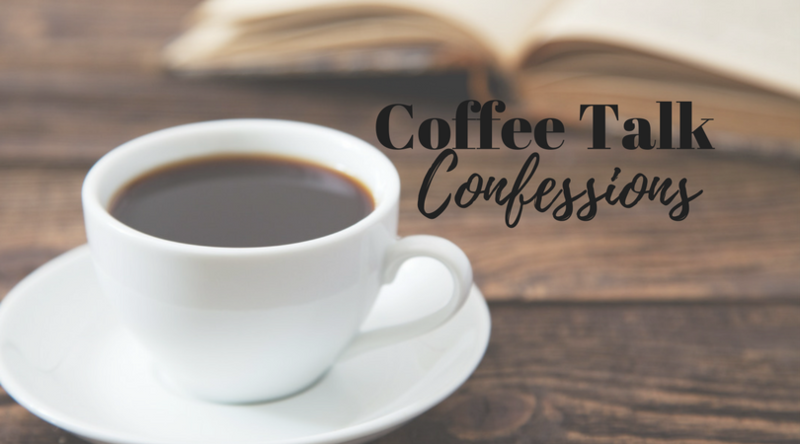 I’ve got a few more confessions comin’ at ya this afternoon! //I’ve been listening to Christmas music on Pandora since November 1. //A little over a month ago I started getting up early around 5:30-6:00, which wasn’t easy for someone who likes their sleep. I found that I really enjoy that early morning quiet time to myself and I think that it has made a huge difference in my mood in the mornings. I try to get things done in the morning, but not every morning is productive. Sometimes I lay on the couch and watch TV. Sometimes I sit outside with a cup of coffee and read a book or study the Bible or sometimes just scroll through my phone as I watch the sun come up. The best part about it is that by the time the girls start waking up around 7:30-8:00 I’ve already had a cup (or two) of coffee and I’m wide awake and more ready to take care of their needs. I also tend to be more patient and less on edge. Before, I would let my kids be my alarm clock and I wasn’t always in the best mood when I woke up. I often felt rushed and I would find myself becoming short and snappy with them. I did not like starting the day like this. Just this one little change has made such a huge difference in my entire attitude. *Thank you to Erica from Whimsical September for sharing your new daily routine and encouraging me to change mine! //Unless it’s like super cold in the house, I always have to sleep with one foot uncovered. But it can’t be falling off the bed. I have a weird fear that something is going to grab my foot if it’s hanging off the bed. //Speaking of weird fears, when I was little I was scared of Injun Joe from the movie Tom and Huck. I would turn my light off then run and jump in my bed. I would surround myself with stuffed animals so if Injun Joe came through my window he wouldn’t see me. Sound logic right there. //My messy bun always looks the best when I throw my hair on top of my head right before I take a bath. But whenever I try to recreate the look to go out in public, I end up spending 15 minutes trying to make it look right…why?!? //I was going through and sort of cleaning up the blog the other day and while going through old posts I was reminded of why I love doing this so much. I found this post about sweet little things that Raley used to do and it had me tearing up. Because honestly, I had forgotten she used to do those things! I love that David and I are able to look back at our lives and be reminded of the little things that made our world go ’round. Thank you for reading – you are the reason I keep doing this. I make zero money off of this blog. I do it because I enjoy it and in hopes that my writing will touch others in some way. Have a great Thanksgiving holiday!